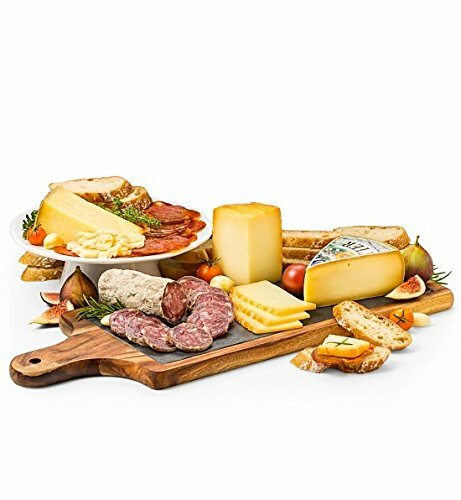 Send along the best with this deluxe acacia wood board inlaid with slate, and gourmet delights from around the world. Carefully-aged Cantalet Dore, Sottocenere, and Petit Basque cheeses complement the heritage flavors of Jamon Iberico de Bellota and Toscano Fennel Pollen Salami.The gift arrives in a handsome insulated tote that makes for a lasting picnic-ready keepsake. Included in this Gift: Artisan Cheeses: Cantelet Dore, Petit Basque. Charcuterie: Iberico Bellota, Fennel Salami, Iberico Salchicon. Farmhouse Slate and Acacia Wood Serving Paddle. Premium charcuterie like decadent Jamon Iberico de Bellota and fine imported cheeses fill this tasting slate and tailored isothermic cooler. Two Cured Iberico Meats, Three Artisan Cheeses. Farmhouse Serving Paddle and Slate.